What is Osen-Guard?｜Organic Anti-Foulant Marine Paint Additive | OSEN-GUARD｜UES Co.,Ltd. 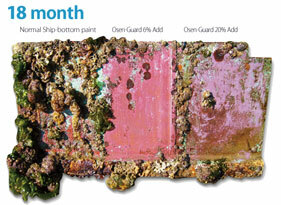 Organic Anti-Foulant Marine Paint Additive "OSEN-GUARD"
Tested in Japan for a period of over 5 years! Osen-Guard is an Eco-friendly additive to marine paints used in the painting of bottoms sections (below waterline) of ocean going vessels such as ships, barges, trawlers, pleasure boats etc. Adhesion of marine living organisms such as barnacles creates a major problem for ship/boat owners especially fishing fleet owners. While fuel efficiency is reduced due to frictional drag, these organisms also chip away at the paint exposing the metal to seawater corrosion. This necessitates more frequent cleaning & paintings which, while increasing costs of labour and paint will also add to the pollution of the sea by increasing the discharge of heavy metals such as Organic Tin mixed in marine paints. Osen-Guard harnesses the combined powers of nature of coconut shell activated carbon and Titanium Dioxide to form a protective barrier against the adhesions of shellfish & other marine organisms without in anyway harming the creatures or the marine environment. It gives excellent results by almost doubling the period of anti-foulant effects by just adding 5% by weight to conventional ship bottom paints. Improves working environment by reduction VOC smells in paints! Copyright© 2009-2012 UES Co.,Ltd. All Rights Reserved.